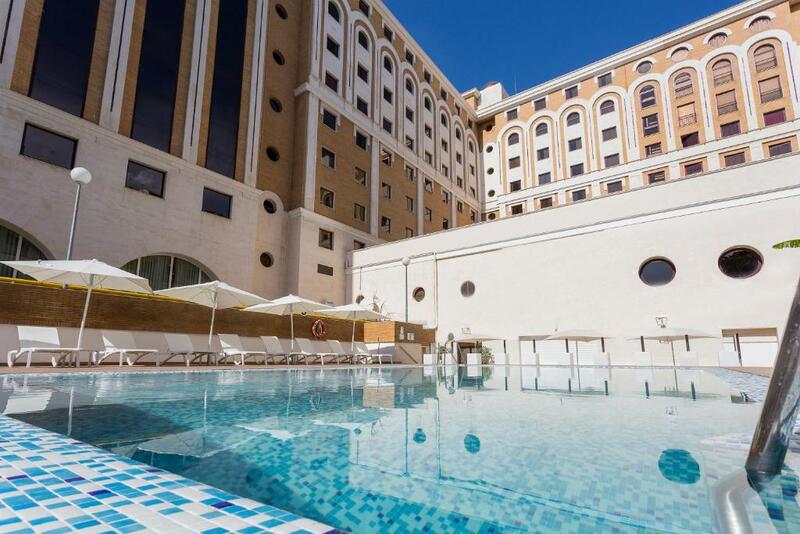 Lock in a great price for Ayre Hotel Sevilla – rated 8.5 by recent guests! There is always a variety of fresh fruits, cakes, meats, cheese, juice fruits. We were always guided to comfortable seating. The lighting of the place was excellent along with very nice and ample clean crystal windows. 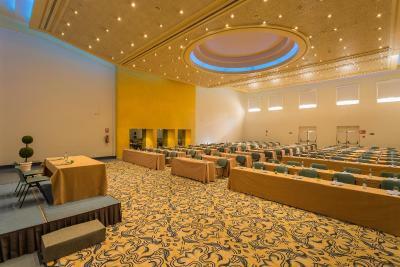 From the photos it appeared we got ungraded to a superior room. The room was of a good size and comfortable. The bed was king sized and the matrass firm - I have a weak back so good for me. Breakfast is good and had lots of food choices although a bit pricey. We stayed for only one night and were very impressed with all aspects of the hotel. 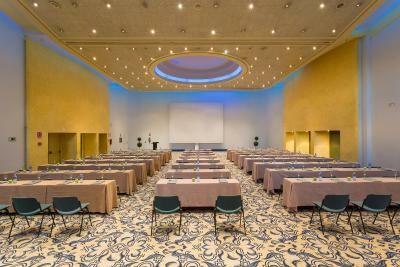 The staff was extremely helpful and the hotel had all the expected amenities. The breakfast buffet was also very good. Buffet good but not clear nresevations and prices. Lack of info. It's a good 4* hotel. Everything was fine. Location is relative. 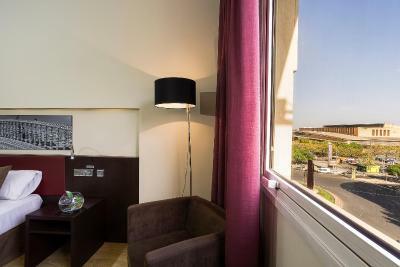 Perfect location for quick, easy access to the airport with the bus stop across the street. 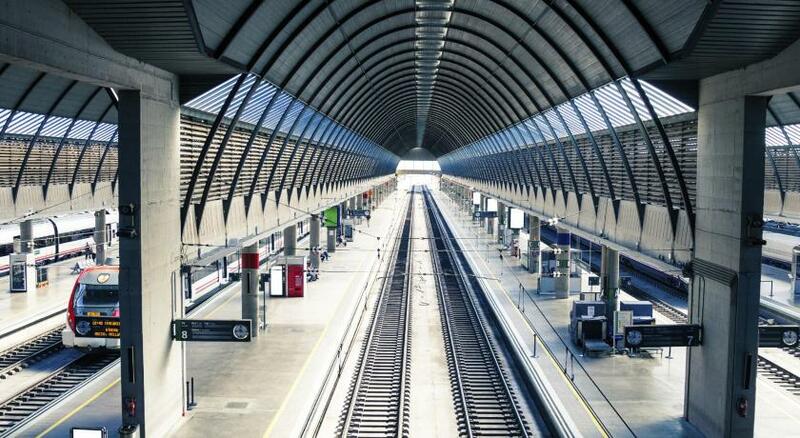 Train station is very close. Old town/sights is probably a 20-30 minute walk. Location is very good. It’s very near to train station. 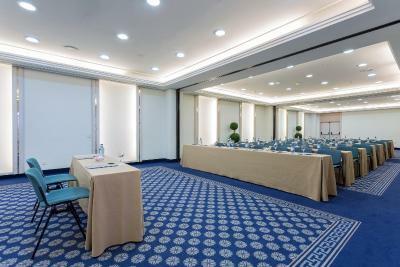 Ayre Hotel Sevilla This rating is a reflection of how the property compares to the industry standard when it comes to price, facilities and services available. It's based on a self-evaluation by the property. Use this rating to help choose your stay! 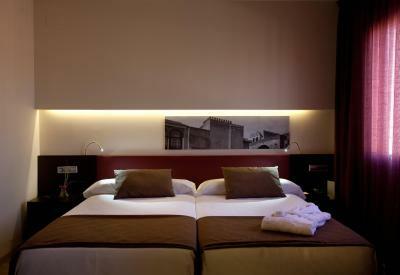 Each air-conditioned room at the Ayre Hotel Sevilla includes a flat-screen TV and a free safe. 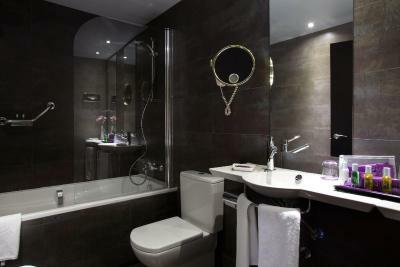 The rooms feature classic décor and private bathrooms. 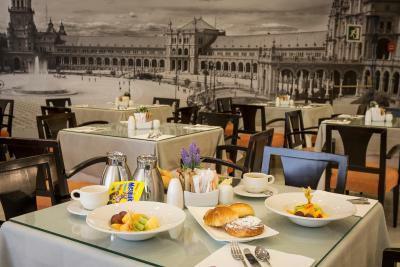 Ayre Sevilla’s Plaza Nueva restaurant serves a breakfast buffet. A range of tapas is available at the Portico snack bar. 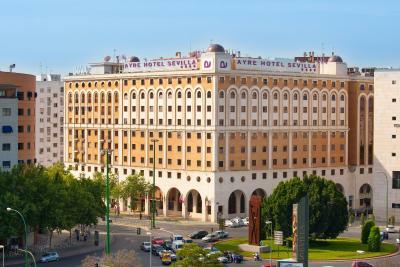 Buses C1 and C2 stop steps away from Ayre Sevilla and provide convenient service to the historic center of the city. The Sánchez Pizjuan Football Stadium is less than half a mile away. Nervión is a great choice for travelers interested in monuments, city walks and old-town exploration. 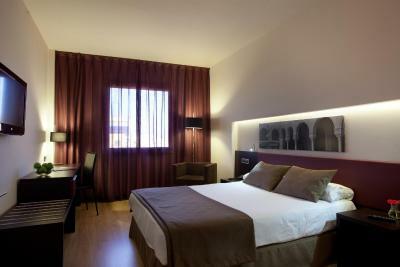 When would you like to stay at Ayre Hotel Sevilla? Free mineral water is provided for the first night. 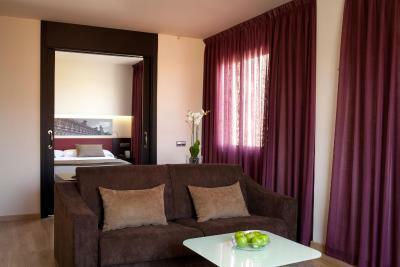 This double bedroom can accommodate an extra bed. 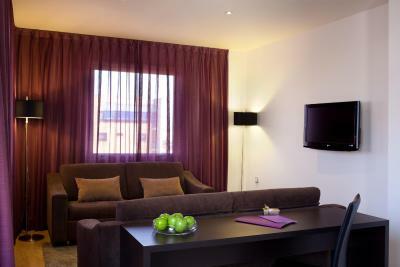 With stylish contemporary décor and free WiFi, this spacious air-conditioned room offers a calm place to relax. 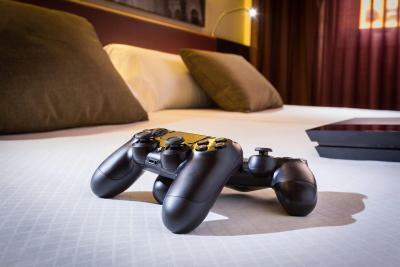 To help you get a great night’s sleep, there’s a pillow menu to choose from. 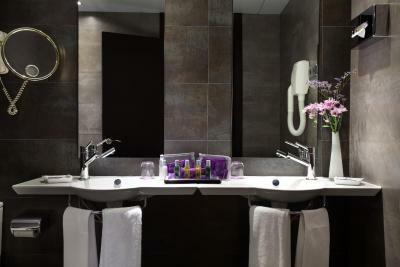 The modern bathroom includes a bathrobe and slippers for your comfort. 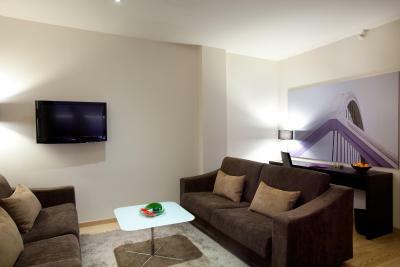 This air-conditioned suite features a traditionally decorated seating area with TV and a private bathroom with free toiletries. 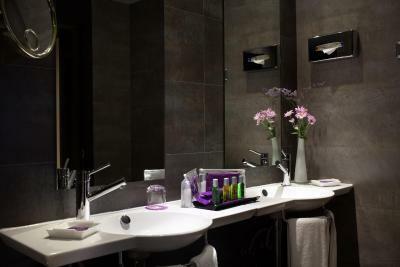 This double room includes free breakfast buffet. 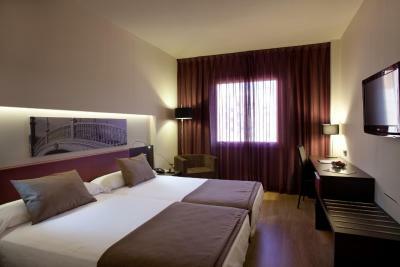 This double room features air conditioning, soundproofing and satellite TV. 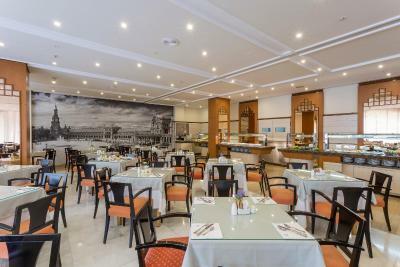 Hotel surroundings – This neighborhood is a great choice for travelers interested in monuments, city walks and old-town exploration – Check location Great location - show map Guests loved walking around the neighborhood! 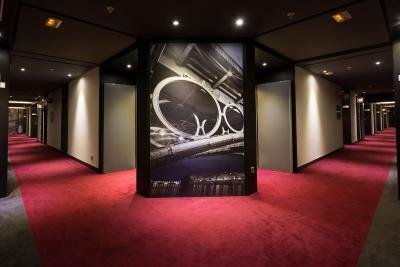 House Rules Ayre Hotel Sevilla takes special requests – add in the next step! 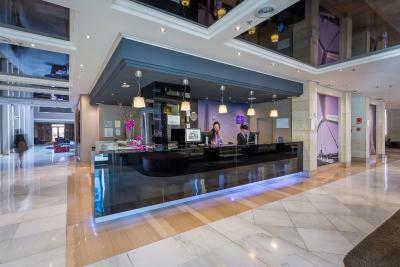 Ayre Hotel Sevilla accepts these cards and reserves the right to temporarily hold an amount prior to arrival. Please note smoking is not allowed in the rooms. Worst staff ever. Locked up our room even though we requested late checkout. The bed is uncomfortable. 30 minute from downtown. Not worth it. 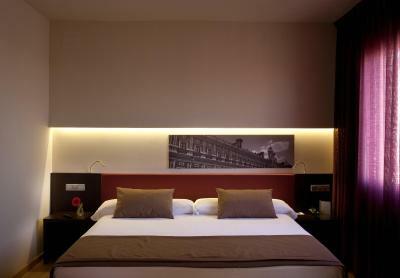 It was right next to Santa Justa train station, with lots of bars, cafes and restaurants nearby! 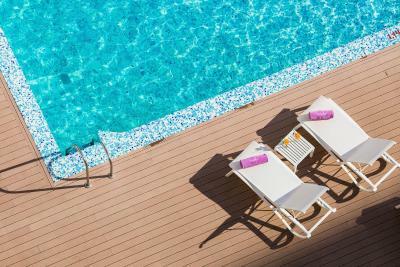 Great swimming pool and outside tables and chairs and deck chairs and great gym. Weakness no. 1: Very slow, almost unfuctional wi-fi, especially in the evening. 2: It's pretty noisy if you open the window. Breakfast - good value for money. Nice, helpful and professional staff. 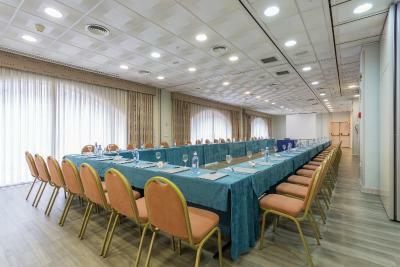 Very good location: very close to bus stops (airport shuttle! ), the railway station; city centre within walking distance. Thought twelve euros for breakfast not worth the price. Cool Fried eggs lying in grease. We liked the cafeteria, food excellent and meant you did not, if you chose, have to get poshed up for dinner. The furniture in the room is outdated. 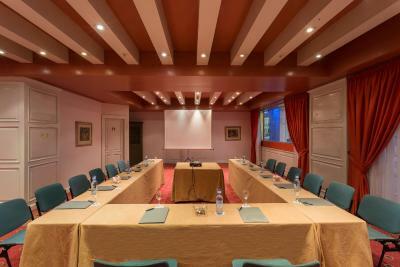 The location ia very good as it is close to the train station and fairly close to the city center. Bed was rather hard for me. Breakfast was good but hot food wasn’t very hot. 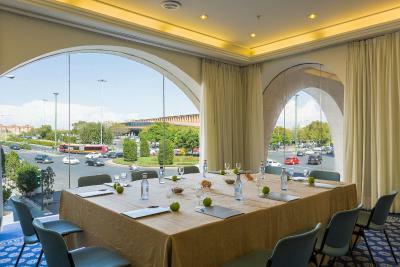 Excellent location easy to get to by airport bus and also by train station. Clean room and friendly staff. 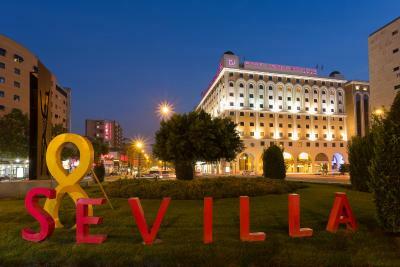 Not much close by the heart of Seville is about a 30 minute walk.